REFLECT: Identify the items within the armor of God that are used as weapons of defense. RESOLVE: Write down one phrase from the passage that reminds you of God's protection. "Therefore take up the whole armor of God, that you may be able to withstand in the evil day, and having done all, to stand firm." 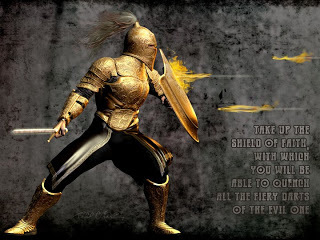 The enemy can not defeat the FULL armor of god. He can hope to deceive or trick us into relaxing our guard so that we do not use the WHOLE armour. We must stay in the "offensive"/"attack" mode; Verse 11 tells us to put on the FULL armor. Elisha Hoffman in 1900 wrote the hymn best for us To Christ Be True. BTW, great jobe boy scouts! Keep putting the vote off until the majority is ready to take a stand! This was my first memory verse 1st grade Faith Baptist, Canoga Park, CA: Ephesians 6:11 Put on the whole armor of God that ye may stand against the wiles of the devil.